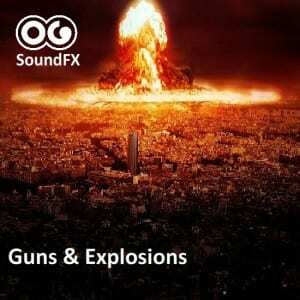 Guns & Explosions is a selection of firearms, large artillery weapons, impact sounds, explosions of all kinds. From a simple gunshot, to multiple heavy weapon shots and bullet impacts, to totally apocalyptic scenes of bombardments. This sound bank also flirts with science fiction weaponry and robot explosions. 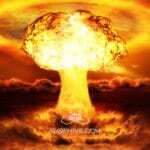 With this libraryyou will have a wide range of weapon and explosion sounds for your films or video games. Note that all the sounds in this library are made from scratch and created artificially. The gun sounds are not actual guns that were recorded. Although I made a lot of field and studio recordings for this library, and I used actual gun sounds, the final sound effects are the result of a mix of different sound elements, sound design and tweaking work. The reason I chose this approach for this library, is that the sounds used in films, documentaries and video games, are often strongly exaggerated compared to the same sounds in real life. We all remember the “punch in the face” sounds from Indiana Jones! I hope you will enjoy this library!